Whether you plan on hosting an intimate patio dinner party, or an elaborate backyard wedding, the right lighting is critical to a successful affair. Professionally designed and installed landscape lighting is a fantastic strategy to ensure the right atmosphere for any event, so it can last well into the evening hours. Professionally illuminating your outdoor space sets the stage for parties. 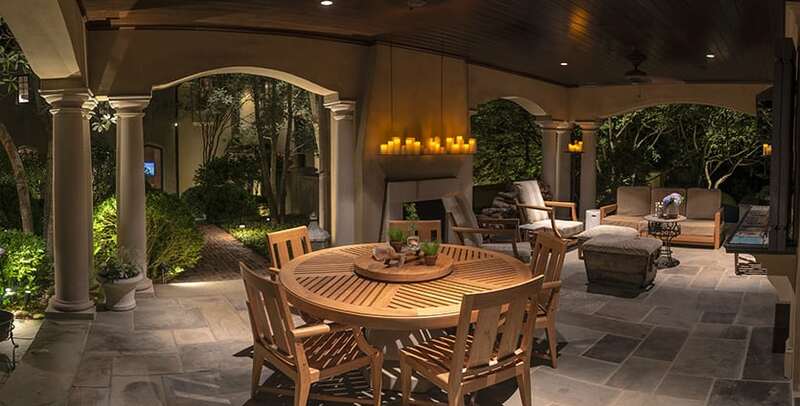 By utilizing multiple lighting techniques, a backyard will always be “party ready”. Above all else, landscape lighting throughout your property makes guests feel comfortable and understand the layout of your space when the sun goes down. Installed lighting fixtures can highlight important areas including entrances, exits, walkways, steps and water features. Installed outdoor lighting can truly take outdoor parties and events to the next level. You can welcome guests with the curb appeal that your lighting design creates and keep the party going well into the night by illuminating the areas where guests will congregate. Properly illuminated walkways are not only helpful for guests, but they also provide safety. 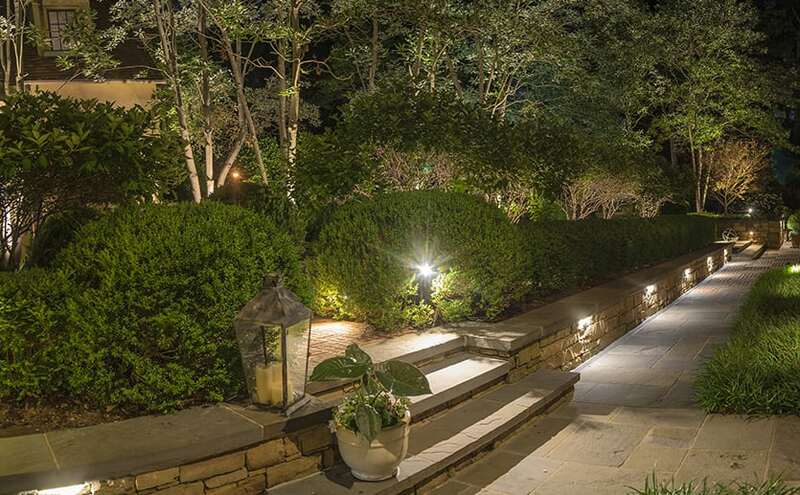 Path lighting can visually delineate the boundaries of your space and lead guests safely from one area to another. Path lighting can be simplistic in design or custom made to highlight architectural and design patterns on your property. Swirl or geometric patterns used on bollards will produce unique lighting details. Bollards can turn a front entrance into an exceptional space or a plain walkway into extraordinary path to meander. Patio and deck lighting helps illuminate steps and railings for your guests. You can clearly define your entertainment space for guests to use. Specialized lighting in outdoor kitchens, bars, and seating areas of decks and patios can create atmosphere and a resort-like feel. Corners, steps and perimeters can be lighted as well. Colored lights can provide a beautiful, serene wash of color, while illuminating edges. LED underwater lights can change color, providing the appropriate feeling for your gathering. Ponds, waterfalls or fountains can be beautifully illuminated. Let light reflect off the water elements in your space for a twinkling effect with a mesmerizing appeal. 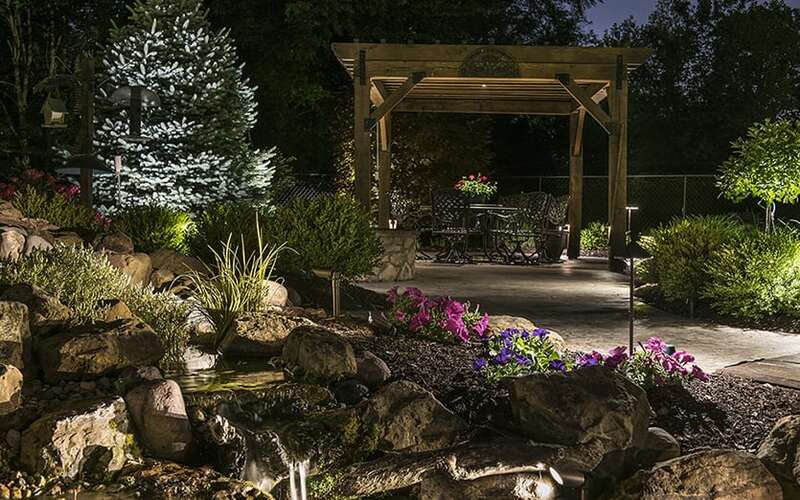 Accent lighting can precisely highlight trees and other backyard focal points. This can be a great way to add an extra layer of drama to your lighting strategy. Spotlight your favorite ornamental tree, a section of your garden, or your landscape art. Present your guests with the beauty your landscape has to offer by showing them directly where to look. 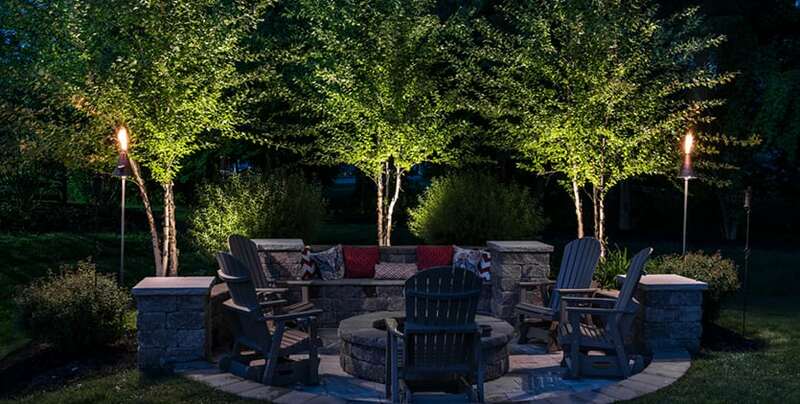 One of the greatest benefits of outdoor lighting is that your backyard will always have the foundation for future events or gatherings. Even better, you’ll be able to take advantage of your lighting between events when you’ and your family enjoy the space on your own. Simply add some candles or personal decorations and some flare to suit your party or event theme and your stage is set. Using a professional will help ensure sophisticated, well-integrated lighting for your next outdoor gathering. Contact your local Lighthouse Outdoor Lighting designer today to discuss how to make your next event truly special.